Join PN+ For Full Access to PowerNation! Activate your PN+ subscription to view this video. Work continues on a 1969 Dodge Charger to adapt a Hellcat drivetrain to work in it; Tommy visits OPGI. We take Project Sydewinder to get its suspension setup for the track. Plus, Tommy and Marc get a rare look inside the Indianapolis Motor Speedway Museum Vault. We get new wheels and tires for Project Sydewinder which means we have to make sure everything clears. Plus we do some body work on our '85 Buick. 85 Buick Regal gets some performance goods for the rear end and Project Sydewinder gets some new wheels and tires. Tommy and Marc make their way to the North American Auto Show in Detroit. Our ’81 Mustang Cobra gets fuel and cooling systems and Project Street Regal gets some upgrades to its dated interior. 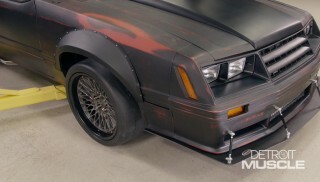 We add some GNX body panels to our ’85 Buick Regal. We clean up and update a set of old Camaro/Nova wheels with fresh paint and trim pieces. Our Mustang Cobra Project Sydewinder gets its aggressive exhaust system and we work on Project Street Regal for larger rear tires. Recap and Forecast on the projects we have in the shop. Install new drivetrain and chassis on Buick Project Street Regal. We get the seats covered on Hard Charger, and she gets a fresh look from the rear. All The Parts Your Car Will Ever Need. 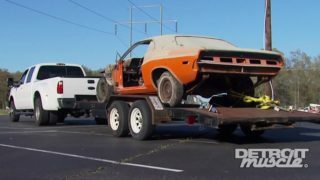 (NARRATOR)>> TODAY ON DETROIT MUSCLE THE GUYS WEDGE THEIR 707 HORSEPOWER HELLCRATE MONSTER MOTOR INTO THE '69 DODGE CHARGER. THEN IT'S A TRIP TO SOCAL WHERE TOMMY VISITS CAR PARTS HEAVEN ALONG WITH A CHEVY SHOW. 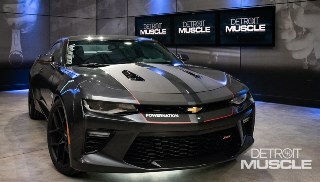 (MARC)>> HEY EVERYBODY, WELCOME TO DETROIT MUSCLE. IF YOU'VE BEEN FOLLOWING ALONG THEN YOU ALREADY KNOW THAT OUR '69 DODGE CHARGER HERE IS GOING IN A COMPLETELY DIFFERENT DIRECTION. WE'RE UPGRADING THE SUSPENSION WITH A MODERN DESIGN AND WE'RE GONNA GO WITH A NEW MODERN DRIVETRAIN. (TOMMY)>> THE POWER PLANT THAT WE'RE GONNA BE DROPPING IN IS THIS 707 HORSEPOWER HELLCRATE THAT WE GOT FROM MOPAR. IT'S GOT A SIX SPEED ON IT, AND GETTING ALL THIS TO FIT INTO THAT IS GONNA TAKE A LITTLE BIT OF WORK BUT IT'LL BE WORTH IT IN THE END. (MARC)>> SO WHAT TOMMY MEANS IS TYPICALLY WHEN YOU DO A LATE MODEL ENGINE SWAP INTO AN OLDER CAR LIKE THIS YOU TAKE THE ENGINE AND JUST DROP IT IN, AND PUT IT WHERE IT LOOKS GOOD, AND THEN START FABBING UP THINGS LIKE ENGINE MOUNTS, AND HEADERS, AND TRANSMISSION CROSS MEMBER, AND THINGS LIKE THAT. WELL THANKFULLY REILLY MOTOR SPORTS HAS TAKEN ALL THE GUESS WORK OUT FOR US. THIS KMEMBER THAT THEY SENT US CAME WITH THESE ENGINE MOUNTS WE SHOWED YOU EARLIER. NOPE, IT GOES THIS WAY, AND THAT'S GONNA PUT OUR HELLCAT ENGINE RIGHT WHERE IT'S GONNA LIVE PERMANENTLY. SO WHAT THEY DID WAS THEY TOOK THE CENTERLINE OF THE CRANK SHAFT AND THEY PUT IT AN INCH AND A QUARTER TO THE RIGHT OF CENTER, THREE QUARTERS OF INCH FROM THE BOTTOM OF THE FRAME RAIL. EXACTLY WHERE AN ENGINE WOULD HAVE COME IN THIS CAR FROM THE FACTORY IN 1969. NOW DOESN'T ACCOUNT FOR FRONT TO BACK, AND THE WAY THEY DID THAT WAS THEY USED THE FACE OF THE BELL HOUSING, AND IT WOULD BE EXACTLY WHERE IT WOULD HAVE BEEN FROM THE FACTORY AS WELL. THAT'S GOOD FOR A COUPLE OF REASONS. ONE, IT SAVES US FROM HAVING TO FIGURE OUT WHERE THE ENGINE NEEDS TO GO AND MAKE ENGINE MOUNTS. 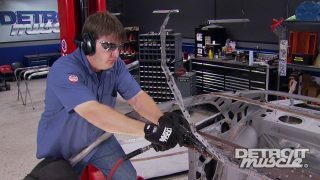 AND TWO, THOSE MEASUREMENTS ARE WHAT COMPANIES USE TO MAKE AFTERMARKET PARTS FOR THINGS LIKE HEADERS AND CROSS MEMBERS. SO THE ENGINE'S OUT OF THE WAY. THE PROBLEM NOW IS THAT TRANS TUNNEL. THE TUNNEL IS JUST TOO SMALL. THE AUTOMATIC AND MANUAL TRANSMISSIONS THAT CAME IN THESE CARS FROM THE FACTORY WERE A LOT SMALLER THAN THAT MAGNUM THAT WE'RE PUTTING IN HERE. THE TUNNEL NEEDS TO BE OPENED UP AND ALSO THIS FLOOR BRACE IS WAY TOO SMALL. THE ARCH HERE IS TOO TIGHT. THERE'S NO WAY WE'RE GONNA GET THAT TRANSMISSION IN THERE. SO WE'RE GONNA HAVE TO DO SOME CUTTING. (TOMMY)>> NOW NORMALLY, I KNOW, MOST OF THE TIME YOU'LL BE DOING AN INSTALLATION LIKE THIS, YOU'D DO IT WITH A CAR THAT'S IN PRIMER, NOT SHINY BLACK LIKE OURS, BUT IT'S OKAY BECAUSE THIS AMOUNT OF WORK AND THIS MODIFICATIONS, WELL IT'S GONNA TAKE OUR CAR TO A WHOLE OTHER LEVEL. WE'RE GONNA START BY MEASURING THE LENGTH THAT WE WANT TO REMOVE, MARKING WHERE WE WANT TO MAKE OUR CUTS. 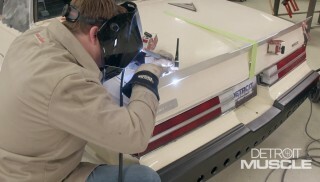 (TOMMY)>> BECAUSE OUR CAR IS ALREADY PAINTED WE'RE GONNA USE A BODY SAW INSTEAD OF TORCH OR A PLASMA CUTTER. WE DON'T WANT TO MAKE A BUNCH OF SPARKS, WHICH COULD DAMAGE OUR FRESH PAINT. (TOMMY)>> WE'RE CUTTING AROUND THE FLOOR BRACE BUT WE'LL GET TO THAT IN A MINUTE. (MARC)>> NOW BEFORE WE CUT THIS FLOOR BRACE OUT WE WANT TO MAKE SURE THAT WE'VE GOT THIS THING NICE AND STURDY. THIS IS A UNIBODY CAR AND THAT BRACE DOES KEEP THIS FROM MOVING AROUND. NORMALLY YOU'D TAKE SOME SCRAP METAL, CUT IT UP, WELD IT IN PLACE UP THERE, BUT WE'VE GOT SOMETHING EVEN BETTER. WE'VE GOT THIS TRANSMISSION CROSS MEMBER HERE THAT WE GOT FROM AMERICAN POWERTRAIN. THIS IS ACTUALLY THE ONE THAT'S MADE FOR THIS CAR. NOW WE ARE GONNA USE THIS ONE. IT'S GONNA BOLT RIGHT IN PLACE HERE, AND ONCE WE GET IT BOLTED IN IT'S GONNA KEEP THAT THING NICE AND TIGHT. THE CROSS MEMBER BOLTS INTO EXISTING HOLES IN THE FLOOR BRACE. ONCE TIGHTENED WE WILL MARK FOR THE HOLES ON THE INNER PART OF THE CROSS MEMBER AND DRILL THOSE OUT. WITH THE CENTER PUNCH ALREADY MADE WE'LL DRILL A PILOT HOLE TO ESTABLISH CENTER. THEN WE'LL MOVE TO THE STEP BIT TO TAKE THE HOLES THE REST OF THE WAY. WE'LL PUT IT BACK IN, HELPING US TO GIVE ADDED SUPPORT AND STABILITY TO OUR FLOOR AND A PLACE TO PUT OUR TRANSMISSION. (TOMMY)>> WITH THAT THING ALL BRACED UP, NOW IT'S TIME TO SLICE THIS LITTLE FLOOR BRACE OUT OF THE WAY. I'LL CUT IT OUT USING A RECIPROCATING SAW, MAKING SURE TO CUT ALONG THE EDGE OF OUR PREVIOUS CUTS. LOOK AT THAT, NICE AND STURDY. IF ANY OF YOUR GUYS ARE LOOKING TO UPDATE OR IMPROVE THE APPEARANCE OF THE FRONT END OF YOUR '70 CHEVELLE OR EL CAMINO WITH A NEW GRILL YOU MAY WANT TO CHECK OUT ORIGINAL PARTS GROUP. 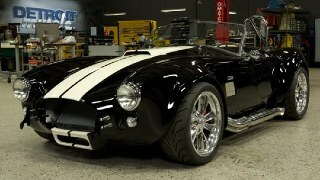 THEY'RE OFFERING A COMPLETE SS GRILL KIT THAT FEATURES THEIR BEST QUALITY RESTO PARTS MANUFACTURED MOLDINGS. IT'S ALSO AN AUTHENTIC REPRODUCTION OF THE ORIGINAL GM PRODUCT. SO IF YOU'RE LOOKING TO FRESHEN UP YOUR OLD MUSCLE HEAD ON OVER TO OPGI DOT COM FOR A FREE CATALOG. (NARRATOR)>> COMING UP, WE'VE GOT TO CRACK SOME MORE EGGS TO MAKE THIS OMELETS BY MAKING SOME MORE CUTS FOR THAT GREAT BIG TRANSMISSION. (MARC)>> ALL RIGHT, YOU'RE CLEAR. (MARC)>> HEY FOLKS, WELCOME BACK. WELL WE GOT OUR HOLE CUT IN OUR FLOOR AND TRANS TUNNEL AND GOT THE FLOOR BRACE OUT OF THE WAY, AND NOW IT'S TIME TO START TRYING TO TEST FIT OUR HELLCRATE AND TRANSMISSION. HOPEFULLY IT GOES RIGHT IN BUT WE'LL SEE. ALL RIGHT, COME ON BACK ABOUT ANOTHER FOOT. A LITTLE BIT, WHOA, RIGHT THERE. (TOMMY)>> DO YOU WANT ME TO LET IT DOWN? (MARC)>> YOU CAN LET IT DOWN ON THE FLOOR CAUSE THIS AIN'T GONNA GO IN THIS WAY. WELL THE PROBLEM HERE IS THAT WITH THE ENGINE AND TRANSMISSION BEING SO LONG AND OUR ENGINE BAY ONLY BEING SO BIG, WE'VE GOT TO REALLY PUSH THIS TAIL SHAFT HOUSING DOWN TO GET IT TO SLIDE IN THERE. I THINK IT'S GONNA BE TOO TIGHT WITH ALL THIS NICE PAINT. (TOMMY)>> YEAH FOR USE. NOW I KINDA THOUGHT ABOUT CUTTING THAT RADIATOR SUPPORT BUT LETS NOT DO THAT. LET'S JUST GO AHEAD AND TAKE IT APART. SAVE SOME WORK. (MARC)>> ALL RIGHT, LET'S GET IT DOWN. ALL RIGHT, COME ON DOWN. (TOMMY)>> THAT LOOK ANY BETTER? (MARC)>> A WHOLE LOT BETTER. EASE HER ON DOWN A LITTLE BIT. DO IT SLOW, LOOKS GOOD. ALL RIGHT, STOP RIGHT THERE. THAT'S WHERE I'D PUT IT. TOMMY GIVE ME A HAND IF YOU WOULD PLEASE. WHAT WE'RE GONNA DO NOW IS TAKE THE MOTOR MOUNTS AND PUT THEM IN PLACE, AND SEE HOW FAR THE HOLES ARE OFF ON THE BLOCK. (TOMMY)>> LOOKS LIKE WE'RE A LITTLE BIT LOW AND NEED TO GO BACK ABOUT THREE MORE INCHES. (TOMMY)>> YOU WANT TO GO ON BACK NOW? I'M TRYING TO BE EASY. (TOMMY)>> ALL RIGHT, THE NEXT TASK AT HAND IS GONNA BE INSTALLING THE TRANSMISSION, BUT I'VE GOT THE BELL HOUSING AND THE FIREWALL TOUCHING RIGHT HERE. SO I'M GONNA TRIM THAT. THAT WAY WE'VE GOT A LITTLE WIGGLE ROOM WITH THAT BELL HOUSING. LIKE BEFORE, WE'LL MARK THE SECTION WE WANT TO AND USE OUR BODY SAW TO TRIM IT AWAY. NOW WE'LL HAVE THE ROOM WE NEED. (MARC)>> A LITTLE BIT MORE. ALL RIGHT, RIGHT THERE. ALL RIGHT YOU'RE CLEAR. (TOMMY)>> WITH THE FORK LIFT OF THE WAY AND THE CAR IN THE AIR, WE CAN REMOVE THE CROSS MEMBER AND BRING THE TRANSMISSION IN. EVEN WE THOUGHT THAT'S A BIG OLE HOLE, BUT AS YOU CAN SEE THAT T-56 MAGNUM FILLED IT UP. (MARC)>> WITH IT IN PLACE WE'LL INSTALL A FEW BOLTS. GET THEM JUST SNUG FOR NOW, AND REINSTALL OUR CROSS MEMBER. 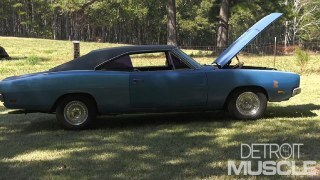 WELL WE GOT OUR HELLCRATE AND TRANSMISSION BOLTED INTO OUR '69 DODGE CHARGER. AND EVEN THOUGH THIS IS JUST ONE BIG MILESTONE ALONG THE WAY I THINK WE CAN CALL IT MISSION ACCOMPLISHED. (TOMMY)>> ABSOLUTELY! YOU KNOW DOING THIS CONVERSION, IT'S GOT A LOT OF BENEFITS. SUPERCHARGED, IT'S FUEL INJECTION, AND IT ALSO HAS AN OVERDRIVE. SO THIS WAS A GREAT IDEA. THE SIX POINT ONE LITER HEMI WAS MADE FROM 2006 TO 2011 AND WAS AVAILABLE IN A MULTITUDE OF MOPAR PRODUCTS LIKE THE CHARGER, THE GRAND CHEROKEE, THE CHRYSLER 300, THE MAGNUM, AND OF COURSE THE CHALLENGER, BUT GETTING YOUR HANDS ON ONE OF THESE THINGS HAS BEEN DIFFICULT BECAUSE OF THEIR HOT POPULARITY AND LOW AVAILABILITY. WELL POWERTRAIN PRODUCTS NOW OFFERS REMANUFACTURED SIXONES FOR PURCHASE. THERE ARE A LOT OF REASONS THESE ENGINES ARE SO POPULAR. THE BIGGEST BEING THAT EVEN IN STOCK FORM, LIKE THIS ONE, IT MAKES 425 HORSEPOWER AND 420 POUND FEET OF TORQUE. THIS HAS MADE THEM A PRIME PLATFORM FOR PEOPLE LOOKING TO DO AN ENGINE SWAP AND JUICE UP THEIR RIDE. WHAT I MEAN BY THAT IS TAKE FOR EXAMPLE HOW A LOT OF OLDER GM VEHICLES ARE GETTING LS ENGINES SWAPPED INTO THEM. YOU'LL SEE A '70 CHEVELLE WITH AN LS SEVEN OR A '69 CAMARO WITH AN LS NINE OR SOMETHING LIKE THAT. 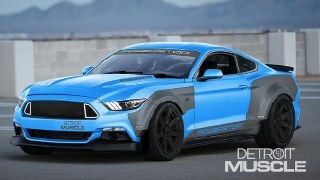 (TOMMY)>> THIS IS MOPAR'S VERSION OF THAT CONCEPT. THIS ENGINE WAS TOP OF THE FOOT CHAIN FOR THE YEARS IT WAS BEING PRODUCED, AND IT'S PROVEN TO BE BOTH POWERFUL AND RELIABLE. (MARC)>> AN EXAMPLE OF THAT IS OUR '69 CHARGER. IF WE WEREN'T ALREADY PUTTING A HELLCAT DRIVETRAIN IN IT BUT WE STILL WANTED TO GO THE RESTOMOD ROUTE, WELL THE SIXONE WOULD BE A PRIME CANDIDATE. WE COULD LEAVE IT AS IS OR THROW A POWER ADDER ON IT LIKE A TURBO OR SUPERCHARGER. (TOMMY)>> BEING A LATER MODEL ENGINE HAS A LOT OF ADVANTAGES THAT PEOPLE ARE LOOKING FOR. GOOD POWER NUMBER AND GREAT RELIABILITY, AND IT DOES IT ALL ON PUMP GAS. SO THIS IS WHY PEOPLE ARE SWAPPING THINGS UP, THAT BETTER TECHNOLOGY THAT COMES ALONG WITH IT. 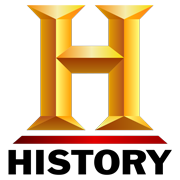 OF COURSE BEING A HEMI IT RETAINS THE HEMISPHERICAL COMBUSTION CHAMBERS THAT MADE THE ELEPHANT ENGINES BACK IN THE DAY SO HIGHLY REGARDED. THIS MODEL IMPROVED OVER THE FIVESEVEN LITER IN JUST ABOUT EVERY WAY, INCLUDING 25 PERCENT MORE HORSEPOWER. 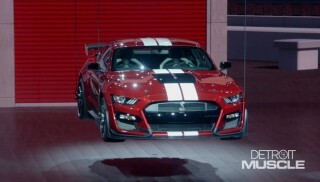 IT DOES THAT WITH MORE CUBIC INCHES, AN INCREASED COMPRESSION RATIO, REDESIGNED CYLINDER HEADS, THE INTAKE AND EXHAUST FLOW MORE AIR, AND IT'S CAPABLE OF GREATER ENGINE SPEEDS. (MARC)>> POWERTRAIN PRODUCTS OFFERS A FOUR YEAR WARRANT STANDARD ON THIS ONE, AND YOU CAN OPT IN FOR A FIVE YEAR NO FAULT WARRANTY. THEY ARE CONFIDENT IN THIS ENGINE, WHICH FEATURES COATED HYPER EUTECTIC PISTONS TO PREVENT WEAR AND IMPROVE CYLINDER LIFE, UPGRADED VALVE SEATS AND GUIDES, MULTI LAYER STEEL HEAD GASKETS, AN IMPROVED OIL PUMP FOR BETTER VOLUME AND PRESSURE, UPGRADED VALVE SEALS, AND IMPROVED TIMING COMPONENTS. (TOMMY)>> SO IF YOU'RE LOOKING TO SWAP IN ONE OF THESE LATE MODEL ENGINES INTO YOUR CLASSIC MUSCLE CAR YOU MAY WANT TO CHECK OUT POWERTRAIN PRODUCTS. (MARC)>> OR MAYBE YOU'VE GOT A LATE MODEL MOPAR THAT'S GOT ONE OF THESE THINGS IN IT ALREADY. NOW EVEN THOUGH THIS IS A REALLY GOOD ENGINE, YOU CAN BLOW THEM UP IF YOU DIDN'T DO YOUR TUNING RIGHT, OR MAYBE IT'S GOT HIGH MILEAGE, OR MAYBE YOU JUST WOUND IT UP TOO TIGHT AND PUT YOU A WINDOW IN THE SIDE OF THE BLOCK. YOU KNOW WHERE TO GO FIND YOU A NEW ONE. (NARRATOR)>> UP NEXT, GET OUT YOUR SUN SCREEN AND SURFBOARDS. TOMMY'S HEADING TO CALIFORNIA WHERE HE'LL CATCH A WAVE AND CATCH UP WITH THE FOLKS AT OPGI. IN THE MEANTIME HERE'S SOMETHING YOU CAN'T UNSEE. DETROIT MUSCLE WILL BE RIGHT BACK. (TOMMY)>> HEY Y'ALL, WELCOME BACK. NOW YOU KNOW IT TAKES A WHOLE LOT OF WORK TO RESTORE A CAR AND A WHOLE LOT MORE PARTS TO DO IT CORRECTLY. NOW WE USE A BUNCH OF PARTS IN THE SHOP, AND A LOT OF THOSE PARTS COME FROM RIGHT HERE IN SEAL BEACH, CALIFORNIA, AT THE HEADQUARTERS OF ORIGINAL PARTS GROUP. OPGI HAS BEEN OFFERING GM AUTHORIZED HIGH QUALITY RESTORATION PARTS SINCE 1982. (JEFF F.)>> OUR WAREHOUSE IS A LITTLE OVER 100,000 SQUARE FEET. WE'VE GOT ABOUT 85,000 DIFFERENT PART NUMBERS. WE'VE GOT PRODUCTS FOR A VARIETY OF GM VEHICLES, CHEVROLET, PONTIAC, BUICK, OLDSMOBILE, AND CADILLAC. (TOMMY)>> WITH A STRONG SALES STAFF OF 30, THEY CAN GET PARTS SHIPPED ALL OVER THE WORLD FROM THEIR EXTENSIVE CATALOG OF PRODUCTS. ONE UNIQUE THING YOU ALSO FIND AT THEIR HEADQUARTERS IS THE IN HOUSE SHOWROOM, WHERE YOU CAN SEE THE PRODUCTS AND BUY DIRECT. (RON)>> TODAY I CAME TO PICK UP SOME PARTS FOR MY FOUR DOOR '70 CHEVELLE. I'M SORT OF OLD SCHOOL. I KNOW A LOT OF PEOPLE LIKE ORDERING THINGS ONLINE BUT BECAUSE MY CAR'S SORT OF A DIFFERENT TYPE OF CAR, A LITTLE HARDER TO FIND, I LIKE TO COME HERE TO ACTUALLY LOOK AT THE PART AND COMPARE IT WITH WHAT I HAVE. CHECK THAT OUT. I MEAN DO YOU NEED ANY MORE ADVERTISING THAN THAT. I MEAN THE ORIGINAL ONE AND THE ONE THAT I JUST PICKED UP TODAY FROM OPGI. IT'S LIKE UNBELIEVABLE. AND IT'S AT A GREAT PRICE TODAY TOO. (JEFF)>> IT'S GOOD TO SEE THE EXCITEMENT ON PEOPLE'S FACES WHEN THEY GET THE NEW PART AND EXCHANGE IT OUT FOR THEIR OLD PART, AND BE ABLE TO PUT ON THEIR CAR. MAKE IT A CLEANER, BRAND NEW. (TOMMY)>> I WANT TO INTRODUCE YOU GUYS TO JEFF. HE'S A PART SOURCING MANAGER HERE AT ORIGINAL PARTS GROUP. NOW YOU GUYS HAVE A LOT OF SWEET CARS LAYING AROUND HERE AND THIS ONE DOESN'T REALLY LOOK THE PART. WHAT ROLE DOES IT PLAY? (JEFF F.)>> WELL THIS IS A '66 LEMANS CONVERTIBLE THAT WE'VE HAD HERE FOR A NUMBER OF YEARS. THE PRIMARY ROLE FOR THIS PARTICULAR CAR IS TO TEST FIT PRODUCT. SO PRODUCT THAT WE MANUFACTURE OURSELVES, OR POSSIBLY PRODUCT THAT WE BUY FROM OTHERS. WE WANT TO MAKE SURE THE PRODUCT DOES WHAT IT SAYS IT'S GONNA DO AND FITS JUST LIKE ORIGINAL. (TOMMY)>> NOW WE HAVEN'T HAD A PONTIAC IN THE SHOP IN QUITE A WHILE. YOU THINK THERE'S A CHANCE WE MIGHT COULD GET IT TO NASHVILLE? (JEFF F.)>> MAYBE, THAT SOUNDS PRETTY COOL. WE GET HUNDREDS OF PARTS IN DAILY AND THEY'LL COME IN THROUGH OUR SHIPPING AND RECEIVING DEPARTMENT. WE'LL CHECK THEM INTO OUR INVENTORY AND PUT THEM AWAY, AND WE THROUGHOUT THE DAY WILL PULL PARTS FOR VARIOUS ORDERS, PACK THEM, SHIP THEM, MOVE ABOUT 1,000 PRODUCTS OUT THE DOOR EVERYDAY. (RON)>> LIKE ANYONE ELSE WE'LL DO SOME PRICE CHECKING BUT THEIR PRICES ARE COMPARABLE TO MOST EVERYONE ELSE'S AND THEY USUALLY HAVE MORE THINGS IN STOCK. CAUSE THEY'RE LOCAL IT'S MY PLACE TO GO. (TOMMY)>> WELL THAT'S THE INSIDE SCOOP WITH ORIGINAL PARTS GROUP. NOW YOU GUYS DON'T RUN OFF BECAUSE THESE GUYS ALSO HOST A COUPLE OF CAR SHOWS A FEW TIMES EACH YEAR, AND WE'VE GOT ONE OF THOSE COMING RIGHT UP RIGHT HERE IN THIS BIG OLE PARKING LOT. (MARC)>> THOSE OF YOU OUT THERE WITH '68 TO '72 GM ABODIES LIKE CHEVELLE, EL CAMINO, OR MONTE CARLO KNOW THAT AFTER A WHILE THAT STEERING CAN GET A LITTLE LOOSEY GOOSEY ON YOU. WELL ROCK AUTO DOT COM OFFERS THIS REMANUFACTURED STEERING BOX. IT FEATURES MAGNA FLUX SHAFTS, A RUST PROOF HOUSING, AND NEW BEARINGS AND SEALS. ALL UNITS ARE TESTED FOR LEAKS AND PERFORMANCE TO MAKE SURE THEY MEET OE SPECS. SO YOU CAN GET THAT ABODY BACK TO STEERING NICE AND TIGHT. (NARRATOR)>> DON'T GO AWAY! UP NEXT WE'LL TAKE A SPIN BY AN ALL CHEVY SHOW WITH SOME REAL HEAD TURNERS. (TOMMY)>> HEY Y'ALL, WELCOME BACK. WE'RE HERE AT THE ORIGINAL PARTS GROUP CHEVY SHOW, AND THERE'S SOME SWEET RESTO MODS LAYING AROUND HERE, AND THERE'S SOME OF THESE ORIGINAL CARS AS WELL. Y'ALL NEED TO CHECK THIS ONE OUT. IT'S GOT SOME RARE OPTIONS. 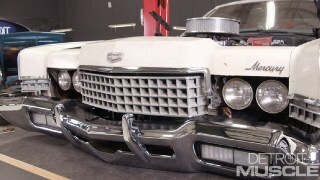 YEAH IT'S GOT THE BIG BLOCK IN IT BUT CHECK THIS THING OUT. A THREE SPEED MANUAL, AND IT'S IN THE FLOOR. I'LL BE THEY DIDN'T MAKE MANY OF THESE. I HAD TO STOP AND TALK TO JOHN ABOUT HIS '69 CHEVELLE. THIS THING HAS A DIFFERENT LOOK THAT SEPARATES IT FROM THE REST OF THEM. WHAT ALL HAVE YOU DONE TO THIS BAD MACHINE? (JOHN)>> I WANTED TO DO MORE OF TRACK FOCUSED CAR. YOU DON'T REALLY SEE A LOT OF BIG ABODY TRACK CARS. SO IT'S GOT AN LS THREE 427 STROKER FROM DART, AFR HEADS, FAST INTAKE, BUNCH OF HOLLEY COMPONENTS. MATT SAVITSKY, HIS PACKAGE FOR SUSPENSION, SCNC. INTERIOR PARTS RIGHT HERE FROM OPG, CARPET KIT. I LIKE A NICE WIDER SEAT SO I GOT SOME WIDER RACING SEATS. (TOMMY)>> WHAT ABOUT ON THE OUTSIDE. YOU USE ANY SWEET OPGI PARTS ON IT? (JOHN)>> THE RUBBER, OPG'S ALWAYS BEEN VERY GOOD TO ME CAUSE I LIVE LOCALLY. YOU WRENCH ON THE CAR AT 10 O'CLOCK AT NIGHT REALIZE CRAP, I'M OUT OF BOLTS. YOU'RE LIKE, WELL THEY OPEN UP AT 7:30. YOU KNOW 7:15 I'M SITTING IN THIS PARKING LOT WAITING FOR THEM TO OPEN AND GO RIGHT BACK TO WRENCHING. THEY'VE ALWAYS BEEN SUPER, SUPER GOOD TO ME, AND THEY'VE GOT EVERYTHING I EVER NEED IN STOCK. (TOMMY)>> WELL ALL RIGHT BROTHER, WE'RE GONNA GO A LITTLE FURTHER. THANKS FOR LETTING US LOOK AT YOUR RIDE. (JOHN)>> NO PROBLEM MAN, THANK YOU. (TOMMY)>> WE'RE OVER HERE IN THE HIGH MILEAGE AND FUEL ECONOMY SECTION TO SHOW YOU GUYS A RIDE, AND THAT IS THIS BRIGHT RED CORVAIR. NOW YOU DON'T SEE A WHOLE LOT OF THESE ON THE ROAD, AND IT COULD BE BECAUSE IT'S REAL DIFFICULT TO FIND PARTS FOR. WELL THAT IS UNTIL NOW. OPGI IS LAUNCHING A NEW LINE TO HELP GET A FEW MORE OF THESE BACK ON THE STREET. (MIKE)>> THEY'RE UNIQUE, THEY'RE DIFFERENT. THEY'RE A LOT OF FUN, AND IT'S A PASSION I'VE HAD FOR 40 YEARS. YOU HAVE TO DRIVE THEM AND EXPERIENCE IT TO UNDERSTAND IT. (TOMMY)>> WHENEVER YOU GO TO A CHEVY SHOW YOU KNOW YOU'RE GONNA RUN ACROSS YOUR '70 RED CHEVELLES, '64 EL CAMINO. 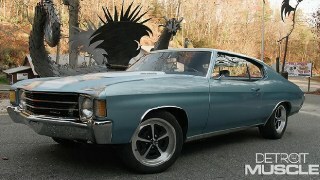 ONE THING YOU'RE NOT GONNA SEE A WHOLE LOT OF IS SOME '73 TO '77 MODEL CHEVELLE MALIBUS. NOW THIS THING HAS ONE REALLY COOL UNIQUE OPTION TO IT. IT'S GOT THOSE SWIVEL SEATS. OH YEAH, THAT DOES MAKE IT EASIER TO GET IN. I LIKE THIS. JUST LIKE ANY CAR SHOW THEY HAND OUT SOME HARDWARE TO SOME OF THEIR BEST CARS AT THE SHOW, AND WITH SOME EXTRAORDINARY AND UNIQUE RIDES THE COMPETITION WAS STIFF, BUT IF YOU HAVE A SOFT SPOT FOR CHEVYS IN GENERAL THIS SHOW HAS EVERYTHING YOU COULD WANT AND MORE. THERE'S NO DENYING THAT A RED SUPER SPORT IS AN ICONIC MUSCLE CAR. NOW THESE THINGS ARE OFTEN TIMES DUPLICATED AND CAN BE A LITTLE DIFFICULT TO PROVE THAT THEY'RE THE REAL THING. THIS CAR'S GOT A PRETTY COOL STORY BEHIND IT. HE BOUGHT IT NEW IN '72 AND ABOUT A YEAR AND A HALF AGO HE WAS WORKING ON THE REAR SPEAKERS, DIGGING IN THE BACK SEAT, AND FOUND THE BUILD SHEET PROVING THAT THIS THING IS THE REAL DEAL. NOW WE'RE ALL OUT OF TIME FOR RIGHT NOW. SO UNTIL NEXT TIME Y'ALL KEEP IT BETWEEN THE DITCHES. (MARC)>> OF COURSE YOU KNOW THAT YOU NEED TO KEEP YOUR POWER STEERING FLUID TOPPED OFF, BUT NOT ALL POWER STEERING FLUIDS ARE THE SAME. PRESTONE OFFERS BOTH TRADITIONAL AND SYNTHETIC FLUID, WHICH HELPS MAINTAIN SMOOTH STEERING AND REDUCE WEAR AND TEAR ON YOUR STEERING SYSTEM. IT ALSO FEATURES AN ADVANCED ADDITIVE PACKAGE THAT PREVENTS CORROSION AS WELL AS EXTENDING THE LIFE OF YOUR SYSTEM. IT MEETS THE SERVICE REQUIREMENTS OF MANUFACTURERS AS WELL AS BEING COMPATIBLE WITH FACTORY FLUIDS. OH AND ONE MORE IMPORTANT THING. ANTIFOAM AGENTS PREVENT PUMP CAVITATION AND STEERING LOSS. WELL THAT'S ALL THE TIME WE HAVE FOR TODAY FOLKS. SO UNTIL NEXT TIME GO TO POWERNATION TV DOT COM AND CHECK OUT MORE TECH LIKE YOU SAW TODAY. SEE YOU NEXT TIME.